Drum Building 101 – How much time and money will I need to invest? How Much Money Will I Spend Building My Custom Drum Set? I recently received an email asking how long it would take and how much it would cost to build a 5 piece drum set. Thanks for the question George, hopefully, this answers it! 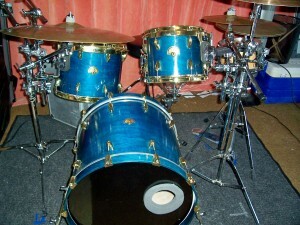 The very first drum set I ever built was this: A 3 piece drum set (10” tom, 14” tom, and a 20” kick drum) that was stained blue and had gold “bling bling” hardware. I later built a snare drum to match the set but it came out a slightly lighter shade of blue than the other drums (more about that learning experience later). 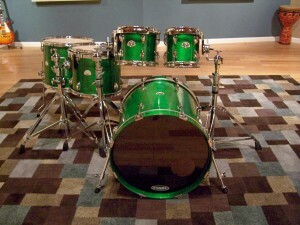 This drum set was my first ever experience with drum building. Before building this I had never worked with wood, I did not consider myself a crafty handyman, and I had never stained anything unless you count grass and coffee stains! A couple of years before building my first drum set I became friends with a guy named Kevin. Kevin owned a recording studio in town. Kevin was the first person to introduce me to the idea of building my own drum set. He had a custom drum set in his recording studio that sounded amazing. When he told me that he made it with his bare hands I flipped out. When he told me how little he spent to make it I flipped out yet again. He had ordered all the materials for the set, stained it, put a clear coat on it, and assembled it…and HE RECORDS THAT DRUM SET ON 90% OF HIS STUDIO PROJECTS! My first build took about 2 weeks to get supplies shipped to me, 2 weeks to complete it and cost me approximately $950. I do not have the receipt to prove it, but….. This 5 piece drum set was built in 3 weeks for $1,369 (that includes shells, hardware, hoops, drum heads, cutting the bearing edges, layout for hardware, rims mounts, tom arms, AND SHIPPING). Here is the receipt for all the materials. 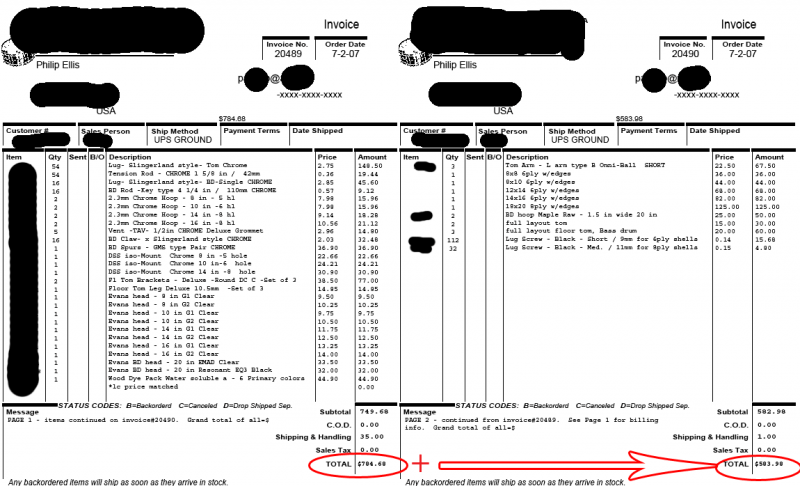 In comparison take a look at what other “custom” drum companies want to charge you for essentially the same drum set. These prices are taken straight from the drum company’s websites, and no I am not kidding. To clarify – I am pricing out the drum set picture above: 8” tom, 10” tom, 14” tom, 16” tom, 20” kick all with standard hardware, stained green and with a gloss finish. Most custom drum companies will sell you drums for less than their advertised prices so let’s say you get a 30% discount. As you can see, it really does cost less to build custom vs. buying custom. The real financial danger is that after you make your first drum, you’ll want to immediately make more! How Much Time Will I Spend Building My Custom Drum Set? 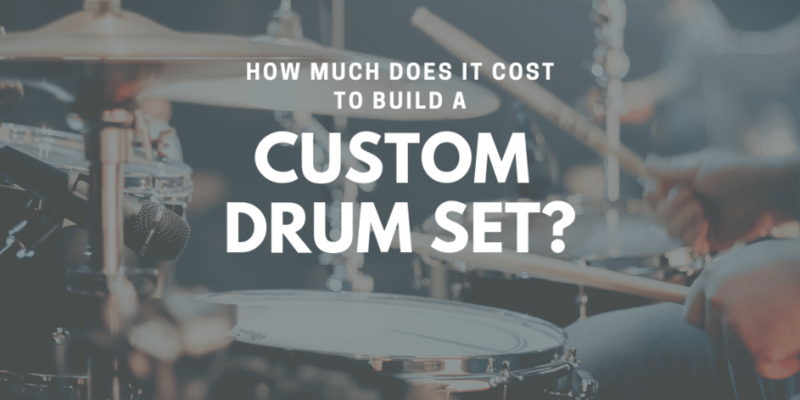 Now that you know how much money building a drum set will cost you, let’s talk about how much time you need to build yourself a professional level drum set. When thinking about how much time it will take to build a drum set you need to keep in mind what type of finish you want on your drums. In my experience, wrapping a drum or drum set can be done in an extremely short amount of time compared to painting, staining, or applying a high gloss finish. Building a drum set that you’ve decided to finish with wrap can be done in a matter of days, (even hours for the more experienced drum builders) simply because you don’t have to wait for stain, paint or clear coats to dry. If you want to apply a high gloss finish, you’ll need at least 3 weeks to build up your clear coats and for the shells to fully dry. Wrapping your drum takes less time, but the material to wrap your drums will cost more. Applying a stain and high gloss finish can be much cheaper depending on what products you use but takes much longer. My advice if you’re looking to save money and get great results AND keep your build time down is to stain it and apply a satin finish. If you want information on wrapping, staining, painting and more ways to finish your drums buy a copy of “How to Make Custom Drums”! Questions? Comments? As always I invite them! Please leave a comment below and I’ll respond to it as fast as I can. I think building your own drums is a beautiful concept. it allows a percussionist to really see why drums make the sound they do. making this website is really gonna help me in the future. 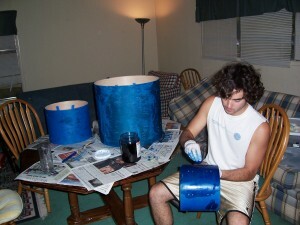 i have only painted drums and sanded them to my liking id love to send a couple pictures of some custom stuff ive done. i love to use just a basic stain with no clear coat im not a huge fan of sparkly and shinny drums. but i do love how there made. im young in building and painting drums but like i said its my beginning of something i could be very passionate and well doing. keep doing what you do man hopefully one day ill have a chance to meet more people who build drums and really are into it as much as i wanna be.